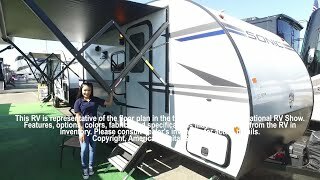 2019 SONIC 169VMK LIGHT WEIGHT TRAVEL TRAILER WITH A BRAND NEW FLOOR PLAN. SUPER LIGHT AT ONLY 3310 LBS. COME AND SEE IT TODAY. CALL 855-235-0291 FOR DIRECTIONS.